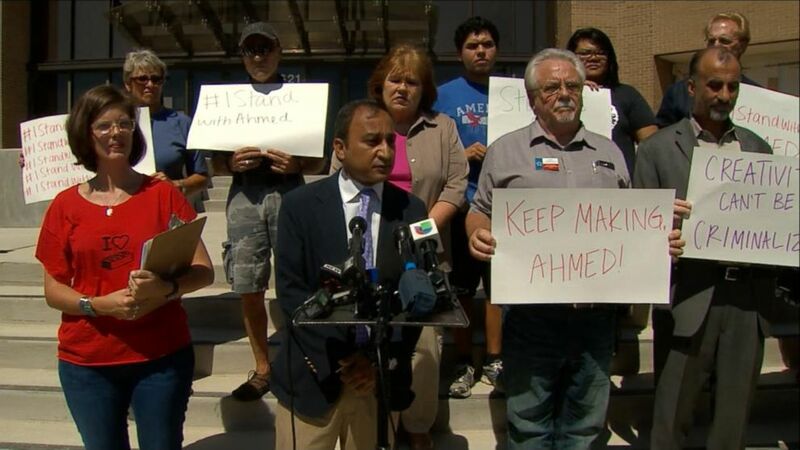 A group of parents hopes Ahmed Mohamed stays at MacArthur High School. A group of parents is petitioning the school district that suspended freshman Ahmed Mohamed for bringing a clock that was mistaken for a bomb to school to reverse its decision and apologize. The parents' group, which held a news conference outside MacArthur High School, in Irving, Texas, today, have penned a petition that states, "Texas Schools: Stop the Profiling," and "Being brown is not a crime." A small group of supporters held signs on the steps of the school with slogans like, "Keep making, Ahmed," "Creativity can't be criminalized," "Parent for science" and "Yes to STEM, No to fear." "Ahmed could have been any of our children, and I see him in my boys," said Kathleen Thompson, a mother of two young sons ages 6 and 10, presenting 92 pages with about 13,400 signatures. The parents said they hope the school re-evaluates its disciplinary policy and balances it with safety. "I’m a concerned parent and I would like to see more students like Ahmed, not less," she said, saying she is concerned about Islamophobia. Since the incident, Mohamed, 14, and his family have said they are considering changing schools or choosing home-schooling. The school has said that Ahmed can come back to school after he finishes serving his suspension. "I don't want him to leave Irving ISD," Thompson said, referring to Irving Independent School District. Shayan Elahi, a civil rights attorney and an Irving property owner, said the school should have brought Mohamed's parents to the interrogation and the school had determined that the device was not a bomb before the situation escalated. "My understanding is that Irving is a very diverse and very cosmopolitan city and we don’t want tarnish its reputation ever," Elahi said, adding later, "We believe no other child should ever have to deal with this, not in this great city." Mohamed was taken into custody this week when a teacher mistakenly thought his homemade clock might be a bomb at the suburban Dallas school. No charges were filed against him. "There was no probable cause for arresting this child," Elahi said, adding that Mohamed was reportedly never read his Miranda rights. "The constitution doesn’t stop at the doors of the school. We do believe school safety is very important...The whole period of an hour and a half was basically discretionary." (WFAA) Supporters of 14-year-old Ahmed Mohamed, who was arrested this week, petition to have his school suspension overturned in Irving, Texas, Sept. 18, 2015. Nationwide, supporters of Mohamed are using the hashtag #IStandWithAhmed. He has since been invited to the White House, Facebook headquarters and MIT for a tour. As for the teacher's actions, the school is supporting her decision to report the clock as a suspicious object. "We do stand behind what the teacher did," the school's director of communications Lesley Weaver told ABC News yesterday. "We believe she was acting in the best interest for the safety of all 2,800 students at MacArthur High School. She followed the correct procedures." Terry Meza, a parent of a college student, said the school is built on what was once her family's farm. "We want to be seen as a city that sees that diversity as an asset," she said. She called for balancing school safety with students’ rights and their dignity. ABC News' Nicole Pelletiere contributed to this report.